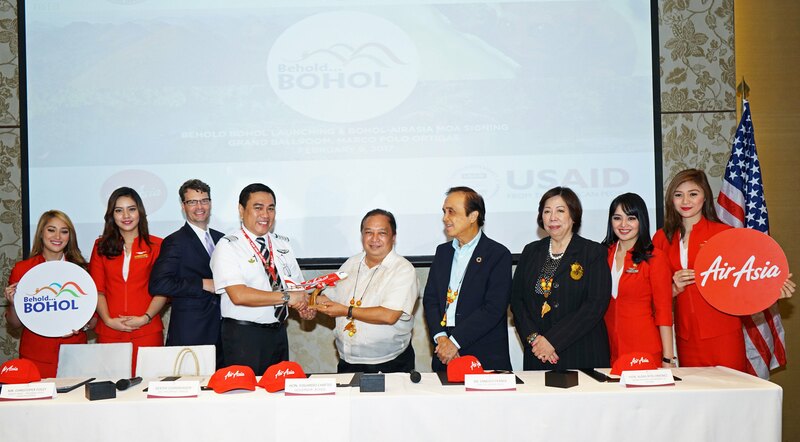 MANILA, 9 February 2017 – AirAsia and Provincial Government of Bohol in partnership with USAID-COMPLETE today formally signed a partnership agreement to promote Bohol as a premiere tourist destination for travelers in the Philippines, in the whole of ASEAN region and in greater Asia where the world’s best low cost carrier by Skytrax provide unparalleled connectivity. To celebrate the partnership, AirAsia is increasing its 3x daily flights between Manila and Bohol (Tagbilaran) to 4x daily starting March 1 with promo fares from as low as P1,599 only and up for grabs now atairasia.com for travel period between July 1 to November 30, 2017. “Our collaboration is built on a foundation that values a strong and innovative service culture which are the hallmarks of AirAsia’s brand of service. We value the community that we serve and as your official airline partner we are committed to connect Bohol and the Philippines to Asean and beyond,” Comendador added. “Following the success of our alliance especially after the 2013 earthquake with the LGUs, USAID-Compete and tourism partners, it would be exciting to see Bohol connect to giant markets in Asia not only for tourism but to engage and promote stronger social and economic ties,” he said. Bohol Provincial Governor Edgar Chatto, Deputy Head of Program Office for US-AID Philippines Christopher Foley, NEDA Director General Dr. Ernesto Pernia, Department of Tourism Undersecretary Alma Rita Jimenez and Philippines AirAsia CEO Captain Dexter Comendador led the signing ceremony which coincided with the formal launch of Bohol’s newest tourism campaign titled Behold Bohol. AirAsia, the leading and largest low-cost carrier in Asia, services the most extensive network with over 120 destinations. Within 15 years of operations, AirAsia has carried over 330 million guests and grown its fleet from just two aircraft to over 170. The airline is proud to be a truly Asean (Association of Southeast Asian Nations) airline with established operations based in Malaysia, Indonesia, Thailand, Philippines, India and Japan. AirAsia was named the World’s Best Low Cost Airline in the annual World Airline Survey by Skytrax for eighth consecutive years from 2009 – 2016. Previous articleGet high speed broadband now!